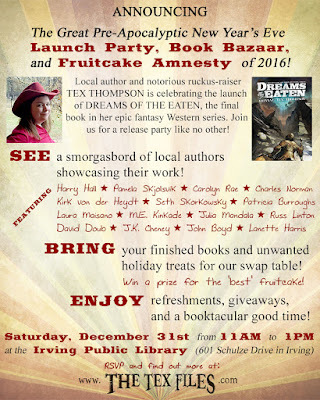 The Tex Files - Home of Arianne 'Tex' Thompson: ANNOUNCING: The Great Pre-Apocalyptic New Year's Eve Launch Party, Book Bazaar, and Fruitcake Amnesty of 2016! ANNOUNCING: The Great Pre-Apocalyptic New Year's Eve Launch Party, Book Bazaar, and Fruitcake Amnesty of 2016! Y'all. It is only seven days - one magical, fleeting week - until Dreams of the Eaten takes flight into the world. And it is no good having a book launch without a book launch party! It's going to be a barnstormer of a time, y'all. We got a book-swap table, where you can swap out your old books and pick up some new ones. We got a goodie gulag, where you can bring your leftover holiday treats (and snack on other people's) before you start that Jan 1 diet. (And yes, I'm giving a special prize for the most egregious fruitcake. Give me your worst. I ain't scared.) Most excitingly, we have suckered sweet-talked no less than FIFTEEN local authors into coming out to showcase their freshest, finest work. If you don't leave this party with a full belly and an even fuller bookbag, I will eat my hat. SO. We're throwing down at the South Irving Public Library. The party starts at 11AM on Saturday, December 31st. Bring your unwanted books, leftover sweets, and all your favorite friends - and be sure to RSVP on Facebook or the official events page so we can fete and feed you in fine style. Be there or be missed!